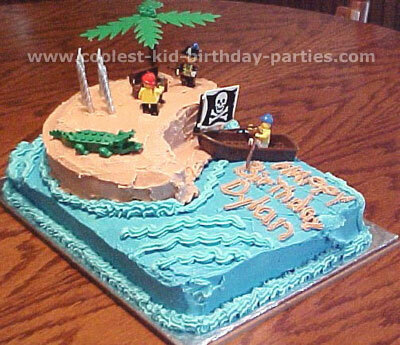 Out of all the many party theme ideas to choose from, we decided to have a pirate party for my son Dylan’s 6th birthday. We used recycled water bottles to hold the invitations we made. The invitations were made using my computer (I used Old English Text font for the invite but I did use Times New Roman font for the important info like date, place, time and RSVP), I then took it to a copy shop and had copies made. Once I had an invitation for each guest I began the detail work. First I ripped each side of the 8 1/2 x 11 piece of paper, leaving the writing intact, next I burnt some of the edges and last I used wet teabags to add some color. They really looked great! I used pirate clipart I found on the Internet for the address label. We rolled up the invitations and tied them with raffia leaving one of the tails long enough so that it would stick out of the bottle for easy retrieval. We also added some sand (from our dirt road) and confetti (parrots, sharks & palm trees). 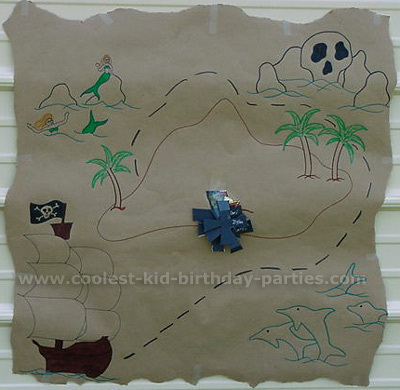 This is one of the best party theme ideas for the pirate party – put together it looked really great as you can see in the picture, just be sure if you are mailing these go very easy on the sand or you can really rack up a postage bill! 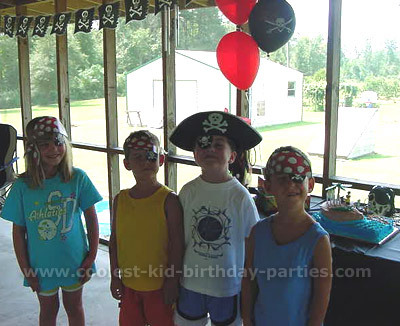 Party theme ideas for pirate decorations included red balloons along with skull & crossbones black balloons, we also used a 12 ft. skull and crossbones flag pennant. 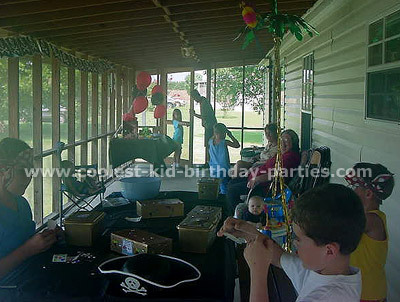 I placed a large 3′ x 5′ pirate flag on the front porch flagpole so the guests could easily find us. For the gift table I placed a skull (Halloween prop) with a large rubber snake and gold beads and coins all around it, this really looked great! As the guests arrived at the party my husband offered his tattoo service with lots of pirate tattoos to choose from. Once a pirate was tattooed they were given a pirate hat, an eye patch and a treasure chest to decorate. I spray painted both diaper wipe boxes and cigar boxes gold for the treasure chest. Each chest had a large sticker I printed off the computer that read, “Hands off! This loot is sole property of (guest name)”. There were also jewel, parrot, fish and treasure chest stickers. After all the guests had arrived we began our games. The first game we played was pin the X on the treasure chest. I used brown wrapping paper and drew a large treasure map using markers on it (I made a replica of the map found on the Family Fun website) then ripped the edges for that old worn look. I used black scrapbook paper to cut large X’s. On the map I placed a glittery sticker of a treasure chest on the island, the child who placed their X closest to this was the winner. Next we moved on to walking the plank. We placed a 2 x 6 across a kiddie pool and secured it to two towel wrapped cement blocks. (We wrapped the blocks in towels so no one would scrape their feet.) I placed many 6-inch rubber sharks in the pool, which was later given out to the children with their goody bags. 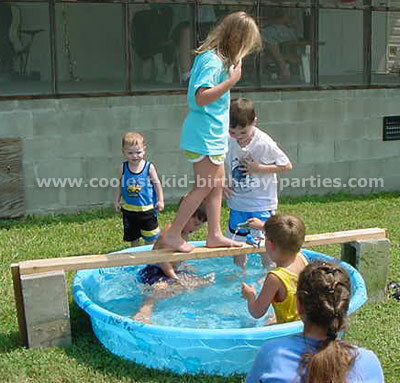 Each child took turns walking the plank but it was so hot they began falling into the shark-laden pool on purpose – they had a lot of fun and cooled off too! 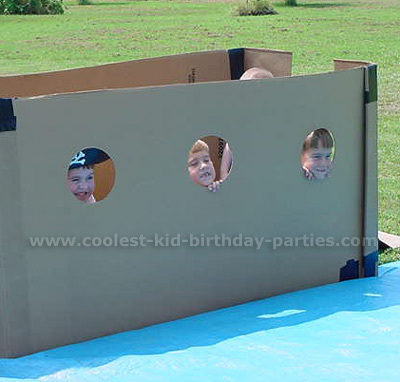 Since all the pirates were wet we moved onto the Battle of Pirates water balloon game – one of the coolest pirate party theme ideas. 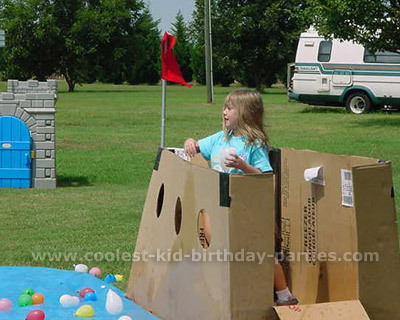 My husband and I had constructed two pirate ships from refrigerator boxes and duct tape, with a door at the end of each ship and three portholes on the front. We then laid a very large blue tarp between the two ships and filled both ships with about 150 water balloons each. The kids loved this water balloon fight even the parents asked if we had extra balloons for an adult battle. It was a lot of fun for the kids and a lot of fun for the parents watching. After the water balloon battle we brought all the kids in for cake and ice cream. My mother did an outstanding job on the cake using Lego decorations, sanitized and washed. She made a 13 x 9-inch cake and placed one 8-inch round cake on top. It was very simple to make and looked great. Once the cake and ice cream were finished we had one more game – the Treasure Hunt. For the treasure hunt we handed out inflatable swords because you can’t go on a treasure hunt without a pirate sword. (Notice we saved the swords for last!) My sister came up with some really cute rhyming clues. The children ran from clue to clue before finally finding the treasure! A treasure chest filled with goody bags! The goody bags were passed out to each child along with a plastic shark from the Walk the Plank game. 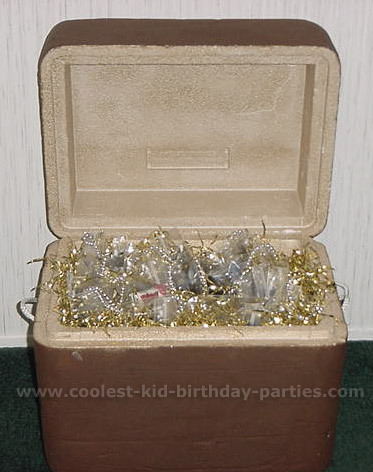 The treasure chest was made from a Styrofoam box that was used to ship Omaha Steaks. I spray painted the outside brown and the inside gold then attached two ropes to the sides. I packed all the goody bags in the chest and added gold Mylar grass for a shiny touch. For the goody bags I just packed everything in Ziploc bags and the kids emptied their treasures in the decorated treasure chests they made. Each Ziploc bag contained lots of gold coins, a pirate pencil, pirate flag, 2 strands of gold beads, 2 ring pops and a few pirate tattoos. The kids loved the pirate party theme ideas and the party turned out great! 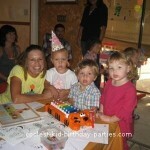 I had two of the children tell me it was the best party they had ever been too. It was a lot of work but well worth it! 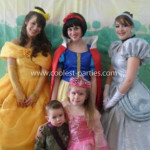 I hope my party theme ideas will help others!